When did I meet Srila Prabhupada? When did I meet Srila Prabhupada? The year Srila Prabhupada arrived in Butler, Pa. (Sept., 1965), is it possible I was visiting my Grandparents in Butler? Did I happen to catch a glimpse of Srila Prabhupada? Or the following summer, at the age of 13, did I happen to walk downtown Butler where His Divine Grace had previously walked? There is no question that Srila Prabhupada's very presence, his kirtan and bhajan, his transcendental preaching, purified the material atmosphere of the Butler area like nothing ever before... at least in THIS age! In 1971 while spending a weekend with a few new friends, our host was often speaking informally on topics of the nature of the soul. I had never heard these topics spoken about in such a deep way! When the weekend was ending, I asked if there were any books containing his contributions to these discussions. He kindly handed me Easy Journey to Other Planets. 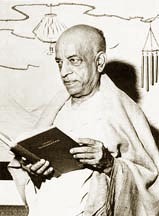 I do not recall a picture of Srila Prabhupada on that publication and of course did not connect "His Divine Grace A.C. Bhaktivedanta Swami Prabhupada" as author until some months later, but I did begin chanting "Hare Krsna Hare Krsna Krsna Krsna Hare Hare/ Hare Rama Hare Rama Rama Rama Hare Hare" as a result of hearing from His Divine Grace. In October of 1972 I moved into a temple 1000 miles away from my first encounter with His Divine Grace via his previous presence, his words, his books! December 1973 I received initiation from His Divine Grace. Yet I had only seen Srila Prabhupada's picture and read his books! Finally after taking second initiation, Srila Prabhupada was going to arrive at the temple I was then residing in. Because it was a large community of disciples and so many had come from far and wide to have Srila Prabhupada's mercy, I still had only caught a fleeting glimpse! Finally I was to actually be in the temple room for the morning lecture as arrangements were made to allow me on the men's side. I will never forget Srila Prabhupada's first words spoken that morning.. before even formally beginning class... and not even recorded anywhere (I have searched and searched): "The problem with you young American boys and girls is you are not afraid enough of Maya!"